In my continuing quest to become a de facto Jesuit priest (albeit one who is married, and whose current ministry is staring at countertop samples at kitchen design stores) I’m reading another fine book from James Martin, S.J. 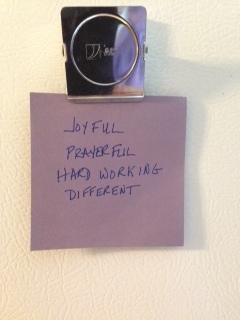 So I took out a piece of paper and wrote out these words, and stuck them to the fridge with a magnet. From what I’ve gathered about Jesuit spirituality, it’s very much about reflection on-the-go: considering who and how you are, and who and how Jesus is, WHILE you’re in the midst of the call of your day. I’m hoping this attempt at refrigerator spirituality will help form me into someone who lives into these fun, inspiring words. This entry was posted in Inspired By and tagged goals, Ignatian spirituality, James Martin, Religion and Spirituality, self-reflection on November 26, 2013 by Trish Ryan.